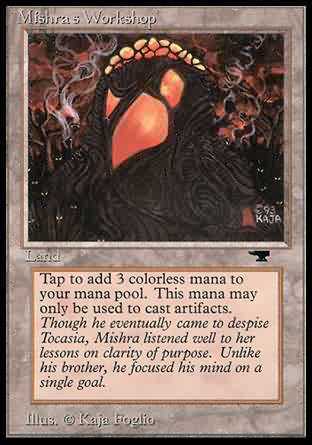 Tap to add 3 colorless mana to your mana pool. This mana may only be used to cast artifacts. T Add 3 to your mana pool. Spend this mana only to play artifact spells. Though he eventually came to despise Tocasia, Mishra listened well to her lessons on clarity of purpose. Unlike his brother, he focused his mimd on a single goal.